Dream beaches and breathtaking nature – the Maldives is brimming with treasures. Experience the best of the tropical island paradise. Discover our top things to do in Maldives. 1. The capital of the Maldives is the island of Male, which, despite its small size, offers a number of sights! Experience bustling markets and a beautiful park. 2. The abundant underwater world of the Maldives makes the archipelago a true paradise for diving enthusiasts. Luminous corals, exotic fishes and turtles flounder in the azure waters of the Indian Ocean. With a bit of luck you can even see dolphins or whales. 3. The fantastic tropical weather, the fine sandy beaches and the romantic sunsets are just some of the reasons why honeymoons are so popular in the Maldives. Exclusive honeymoon hotels will provide you with a romantic and highly cherished experience. 4. 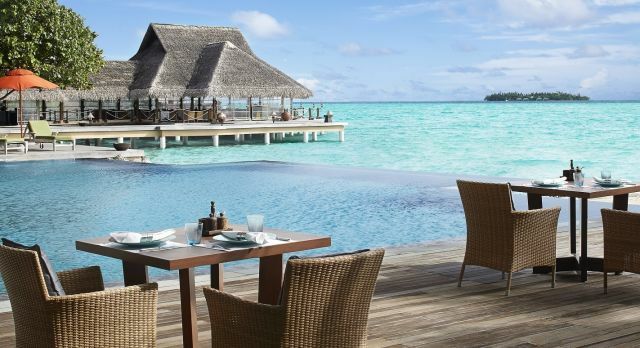 A highlight of the Maldives are the luxurious beach resorts, many of which are situated on their own island. Relax away from other visitors and regenerate your body and mind with exclusive wellness treatments. 5. Daily fresh fish and seafood of excellent quality are the main ingredients of the local cuisine, and make the Maldives a feast for gourmets. Would you like to spend a relaxing Maldives holiday? Our specialists will be pleased to advise you and plan your trip around the highlights of Maldives!